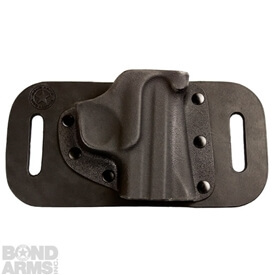 This is our premium holster for the Bond Arms Backup Model Derringer. You will not find a finer holster. Fully lined to protect your derringer’s finish and finely appointed with retention strap makes this the best choice for these derringers. 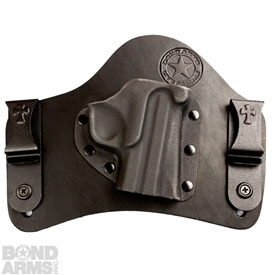 Unlike the standard BMT holsters, the Backup BMT holster is open-ended. 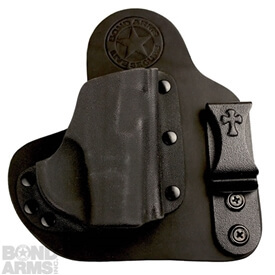 The Backup Holster comes in black with a belt loop for belts up to 1 1/2″ in width. Available in both left and right handed models. 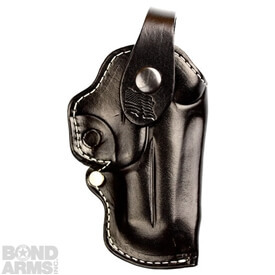 The Bond Backup holsters are made for the Bond Backup Firearm – they will only fit Backup firearms which have a trigger guard and a 2.5″ barrel. These holsters are meant to be used with the Satin (smooth polished stainless steel) finished firearms. If you have any other type of finish a Smooth Lined Holster will work best. Other types of finishes include: Cerakote, Bead Blasted, painted, or matte finished. Can I Use Oil On My Bond Arms Leather Holsters? Yes, you can use oil on your holster, however, you can only use vegetable oil. If you use any other oil for your holster you will damage your holster and our warranty will not cover any damages to your holster from using the improper oil.